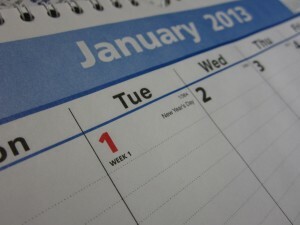 January first is three days away. January first is a magical red number day, where all my bad habits will go away. I will make a list of activities I am resolved to start on January first. The start of the year is the best day to start a new habit. I will stop sleeping late and get up early to write. I will stop eating all of the bananas and share, and I will give away all of the items I am emotionally attached to in the basement. I will do the activities on my list for approximately six days. After six days, I will sleep late, and not write in the morning. I will eat all of the bananas; I will not share. I will open a box in the basement and get overwhelmed and go back upstairs. I will get discouraged and give up. The negative thoughts will start again, and I will quit. Then I will wait for the next January first to try again. I don’t have to wait until Tuesday, January first. There is no magic in the first day of the year. If I rely on a specific day and then fail, I have to wait another year to start again. If something needs to change in my life, the best time to start is now. Right now. Make a decision and follow through. Be brave and begin. Everyone had to start from the beginning. Every book that was ever written, started with the first sentence. Every song that was written, started with the first note. Every sink full of dirty dishes started to be clean by washing one plate. If you want to write a book, sit down and write one sentence. If you want to lose the ten pounds that is hanging around your waist, start by eating a little less, just lose a few ounces to start. If you want to clean the kitchen start by washing one plate. You don’t have to change on your own. You don’t have to rely on The Magic of January First. You can do all things with the help of someone stronger. Philippians 4:13 says, I can do all things through Christ who strengthens me. Is there something you want to do differently? Is there something you are waiting to start? I told you what was on my list. Please tell me what is on your list.